In the current environment, the first component of the ecosystem involves a public safety answering point (PSAP) receiving a 911 voice call from a citizen. Next, the information received from the caller is processed at the PSAP-level by a call-taker, who typically inputs relevant information into a CAD system. Finally, a dispatcher sends the appropriate emergency response to the incident while relaying the relevant information to first responders via an LMR system. 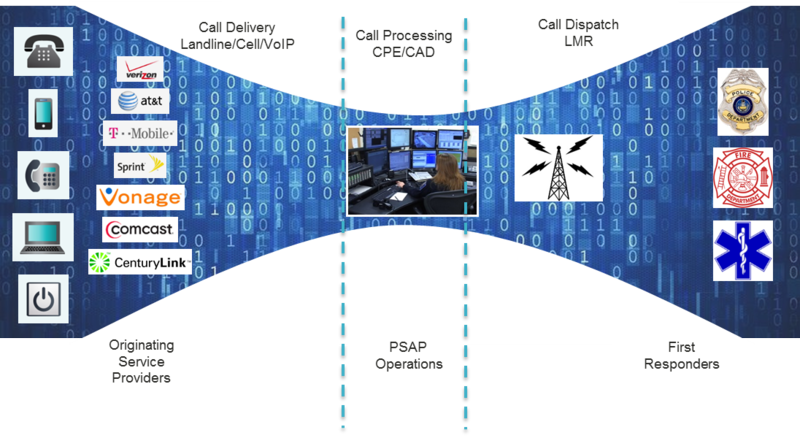 The various technical configurations and processes involved in these three components largely have evolved as separate pieces of the overall communications ecosystem—Call Delivery, Call Processing, and Call Dispatch—which is depicted in the figure below. Today, we stand on the precipice of another technology transformation like the advent of 911 service so many years ago. The foundation of this transformation lies in the development and deployment of Internet Protocol (IP) networks capable of transmitting large amounts of data, including voice, text, images and video. Emergency Services IP Networks (ESInets) will provide a foundation that enables citizens to not only transmit voice calls, but also multimedia messages and other information to the PSAP during an emergency. Public safety broadband networks such as the nationwide public safety broadband network (NPSBN) being built by the First Responder Network Authority (FirstNet) in partnership with AT&T will enable first responders to receive vital data that can be used to make their response much more efficient and effective, while keeping them safer. The transformation to this technology is in its infancy and, as public safety moves through this transformation over the next 5-10 years and beyond, it is critical that the sector begins thinking of the public safety communications ecosystem as a holistic network, i.e., a network of networks. The new public safety ecosystem will interconnect on many levels to enable the smooth flow of critical and relevant data to provide emergency responders with the best information to perform their duties. The figure below depicts the future environment of public safety communications. A treasure trove of information exists that could enable public safety responders to be significantly more informed of the circumstances and details of the emergency to which they are responding. Information from citizens who take photos and videos of incidents in real-time and information data from billions of sensors that are deployed across the country now will be available and accessible. One of the keys in constructing the new ecosystem will be ensuring the smooth and efficient flow of that information from the citizens and sensors to the first responders. To do that effectively, the networks involved must interconnect. Whether that interconnection occurs directly between the networks, or via an application such as CAD that provides the intersecting piece, it is imperative that public safety starts seeing the entire picture, and not just the individual pieces. FirstNet and AT&T are focused on public safety adoption of NPSBN, as is their charge, and many in the 911 world still are focused mainly on the call delivery. PSAP operations managers are focused on the processing of the information once it gets to the PSAP. While it is important that each one of those systems continue to evolve, it is critical that the evolution takes place with an eye toward the future. On the public side of the PSAP, we need to consider how multimedia from citizens and sensors will reach the PSAP and what types of processes and applications will be necessary to aggregate and parse the potentially huge amounts of data. Overloading first responders with information that they cannot possibly process while responding to an emergency must be avoided. Intelligent applications will need to be developed to assist the humans working in the PSAP to sort through the data to ensure only the most important and useable is sent to first responders. Will there be times when information is permitted to pass from citizens directly to first responders over the NPSBN? A decision will need to be made over the coming years as the networks and technology mature and evolve. An article by Susan Mende of the Watertown Daily Times (New York) was published on December 4, 2018 concerning the local school district obtaining money to purchase personal emergency alarms for all school teachers which, when activated, could send notification of the emergency directly to first responders. This is just one such example of the type of information that may have to flow directly across the entire ecosystem to meet the expectations of the citizens for emergency response. 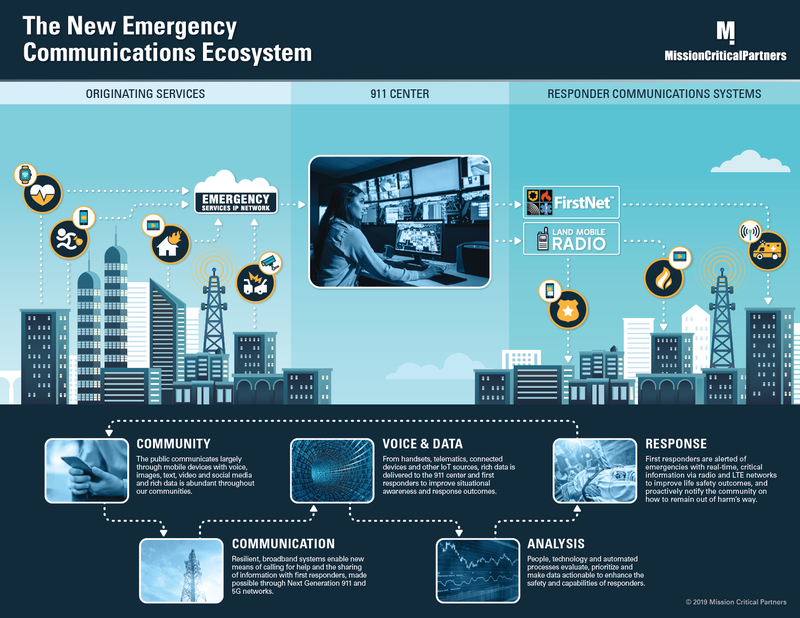 As we move forward over the next several years, everyone involved in the communications aspect of emergency response needs to start thinking of the ecosystem as a single entity, taking into consideration how each piece will interconnect and interact with the others. The days of piecemealing and siloing the communications environment must end if technology advancements are to be leveraged to realize significant improvements in emergency-response outcomes. The NPSBN was created by the Middle Class Tax Relief and Job Creation Act of 2012 (Act). The Act created FirstNet as an independent authority within the National Telecommunications and Information Administration (NTIA) residing in the U.S. Department of Commerce. FirstNet was given license to 20 MHz of spectrum in the 700 MHz band and charged with building and operating a nationwide broadband network dedicated to public safety responders. Through a public procurement process, FirstNet entered into a partnership with AT&T to build and operate the NPSBN for 25 years.